and all these points are exactly the reason I haven’t updated the photo on my licence. 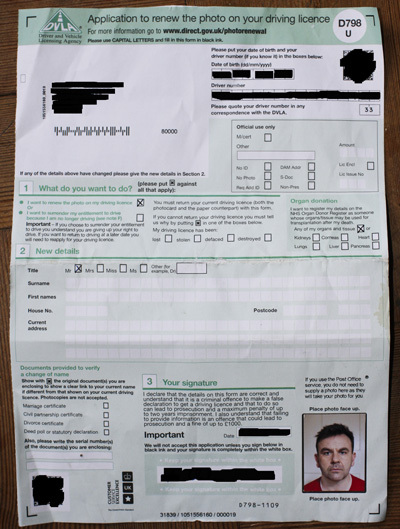 The form doesn’t really make sense, on-line was useless as my passport is also expired. I didn’t even know the picture needs updating every ten years because I rarely have need to look at it (it spends most of its time stashed away with all my other important documents in the house) and was pointed out to me by someone in the post office just the other week. The photo expired in 2009 and I’ve not once had a letter from the DVLA to chase me up for it. I look almost exactly the same as I did ten years ago (slight different hair style) but for the most part I’m still that dashingly handsome and baby faced 21 year old in the photo! Given that a bloke with a cork eye could tell that photo was me, why do I have to pay £20 to update a photo that doesn’t really need updating? oh I forgot to add. A really useful feature I’m sure they could implement is the ability to make an online payment, send me some sort of transaction code which I can then fill out on the form to send off. I don’t want to pay the post office £4.50 to take my photo, neither do I want to pay the £2 it would cost for a postal order and my bank no longer supply me with a cheque book. Not very future proof. Design is a problem in every sector (I’m in the voluntary sector). I think that most people who create user interfaces (forms, letters, website etc) don’t even realise design is an issue (or even what design actually *means*), and certainly wouldn’t know how to address it or be able to justify it to managers. For my own part I’m well aware that we do an atrocious job a lot of the time, but how do we raise it’s importance, resource it, test it and fix it? Paul – hi. Your saga plus a sudden awareness that I’ve been waiting for a government form through the post prompted me to dust off my current passport application. Different experience, same frustration – http://helpgov.wordpress.com/2011/03/14/applying-to-renew-a-passport-online/. All the best. Brilliant. You made my day. I’m needing a new passport and a new photo for my Licence – so thanks for all the info! Great post, Paul. I wonder what it would take to make that journey perfect (or at least reasonably good!). It would almost be worth doing just as a test. In theory, it shouldn’t be difficult, but in practice it might be. Obviously, the wider point is that if you built the right culture and processes, then things might fall into place! This demands a response from the DVLA – you’ve basically done a free consultancy project for them! Great article. It’s the same reason people do not pay tax, VAT, or tell the government where they live. The government gets the money and you get the hassle. If government stopped new laws, and worked on the mess the last 5 lots have created, they might get our vote. When I initially got my driving licence it somehow acquired a full stop between my first and middle name. I never noticed this until I came to try and change my address online. It wouldn’t let me enter my name without the full stop (because obviously that’s not the record), but it wouldn’t let me enter the name with a full stop because it’s an unrecognised character. I was going to have to write them a letter to sort it out, I never did. 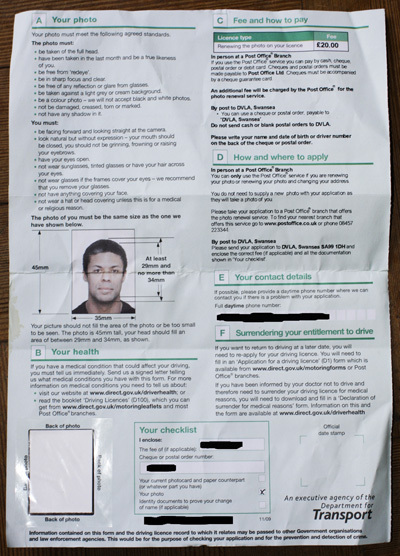 But somehow they have found out I’ve moved because I got this form through the post a couple of weeks ago. I had a similarly annoying experience with the website and haven’t got around to sending it either.